Who are some of the world's famous beekeepers? A. With about 100,000 beekeepers in the USA and Canada today, and several million beekeepers throughout the world, one would hope that at least a tiny percentage of these folks have distinguished themselves in other fields as well! Know someone you think belongs on this list? Send an e-mail. Our panel of judges will review your suggestions. Abbe Collin - This beekeeper invented the queen excluder in France, in 1865. Alexander the Great - Conquered the world, then died thousands of miles from home - his men carried his preserved body home for burial in a golden coffin filled with honey. Aristeaus - He was Virgil's character in Georgics, and was the Greek patron of beekeeping; he played a scandalous role in the death of Orpheus' love, Euridice. Aristotle - This Greek beekeeper and scientist used simple hives with wooden strip top-bars. Some of his observations about bees were pretty clever, others were dead wrong. Arthur Dobbs - Around 1750, this beekeeper and botanist discovered that bees pollinate flowers while gathering nectar and pollen. He also noticed that a bee stays on the same flower type while collecting: "..I have frequently follow’d a bee loading pollen upon its legs, through a part of a great field in flower; and upon whatsoever flower I saw it first alight and gather the pollen, it continued gathering from that Kind of Flower; and has pass’d over many other Species of Flowers, though very numerous in the field, without alighting upon or loading from them eventhough the Flower it chose was much scarcer in the Field than the others." Augustus - Worried that he might not live forever, the Roman Emperor Augustus asked a centenarian how he had lived to be a hundred. The reply: "Oil without and honey within." A.Z. Abushady - In Reminiscences of A.Z. Abushady, Poet-BeeMaster-Humanist the story of Dr. Abushady (1892-1955) describes how he promoted various beekeeping developments in England and Egypt. Ben Franklin - With everything from bifocals, lightning, fossil fish, and the US Constitution in his realm of interests, it is not surprising he is mentioned by Thomas Wildman as a patron for Wildman's 1768 Treatise on the Management of Bees. As patron, Franklin would have paid for a copy of the book in advance. Whether Ben had bees, we don't know. Berbard de Mandeville - wrote Fable of the Bees in 1723, a book which formed an important influence on Adam Smith's Wealth of Nations. Bill Dennison - This former Mayor of Toronto and beekeeper had bees before his election- keeping them in the heart of the city. Whenever there was an angry swarm, the police would call His Majesty the Mayor. He would get his smoker and go fetch the bees - not every city of 3 million can claim such hands-on care from an elected official!! Bishop William Skylstad - Amateur radio enthusiast, beekeeper, fisherman - and in 2004, President of the U.S. Conference of Catholic Bishops. Bob Maguire - Father Maguire was a beekeeper, "one of the finest periods of my life" before becoming an activist Australian Catholic priest and community worker. Brigham Young - A very famous American beekeeper... His interest in bees led to Utah being called the 'Beehive State' and having skep hives as emblems. Brother Adam - Previously known as Karl Kehrle, Brother Adam was the Benedictine monk (Buckfast Abbey, England) who developed the famous Buckfast Bee, and became the leader of a short-lived beekeeping cult movement. Cave Folks - These early impressionist artists created the first images of bee culture in history with their cave paintings in Spain, 6000 B.C. Charles Butler - This naturalist and beekeeper realized the "King Bee" is a "Queen Bee" - he wrote Feminine Monarchie. In 1609, he discovered that drone bees are male bees. Charles Martin Simon - beekeeper and author of a dozen books - see his web site. Charles Henry Turner - In about 1890, Dr. Turner was the first African-American to earn a PhD at the University of Chicago. His 30-plus research papers were written during breaks from teaching high school (not university) in St. Louis, as racial prejudism barred him from working, teaching, and researching at colleges or universities. His work on colour-vision of bees and their recognition of patterns and shapes (and his ability to time bees' appearance for feedings) predated von Frisch's similar work and Dr. Turner's many published papers probably influenced the Nobel winner's work, although von Frisch never acknowledged Turner's work. Charles Mraz - Mraz was a pioneer in bee sting therapy. As a beekeeper and apitherapist for more than 60 years, he also used bee venom to treat patients with arthritis, multiple sclerosis, and a host of other disorders. Columela - Born in Gades (Cádiz) in the first century BCE - he wrote De Rustica which discussed the honey bee, and the first system of cuadros móviles (moveable frames!). Dan Quayle - This former U.S. vice-president's response to beekeepers seeking price-support help was "Beekeeping is a sweet subsidy that has been ripping off taxpayers for years." Indeed? D.C. Jarvis - This Vermont doctor's book Folk Medicine made honey very popular in the 1970's - honey prices went from about $0.20 US to $0.50 US per pound after the release of his million-copy selling book! He particularly urged a prescription of two teaspoonsful of honey and two teaspoonsful of apple cider vinegar taken in a glass of water one or more times a day. Democritus - This famous ancient (How ancient? He lived to be 109. That's ancient.) Greek apicultural researcher, beekeeper and philosopher taught that new bees could be made from rotting oxen - the King Bee, he figured out, came from decaying bull brains. And we named "Democracy" for him. Dr. Suess - Probably not a beekeeper. 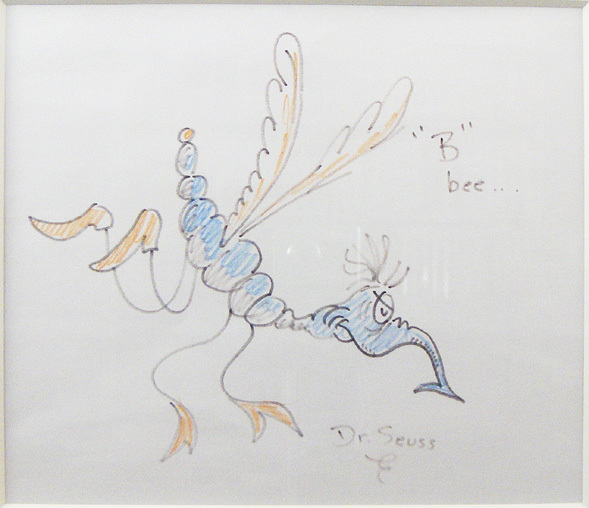 But he did draw the Skritz, which he labeled B bee and included it in his book I Had Trouble Getting to Solla Sollew. If you've got a spare ten thousand pounds to spend, you could buy the original sketch of the Skritz. Earl Emde - A brilliant beekeeper and queen breeder, he began keeping bees in southern California, ended up with thousands of hives throughout the US and Canada. 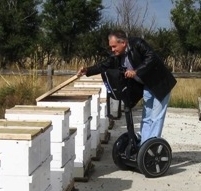 He and his sons may have been the first to use forklifts and pallets to move colonies of bees. E B White - Author of the 1945 New Yorker magazine poem Song of the Queen Bee in which he criticizes the development of artificial insemination of queen bees: "What boots it to improve a bee, if it means an end to ecstasy?" E C Porter - This American invented an easy way to clear bees from honey supers - the Porter Bee Escape, in 1891. Elton Dyce - In 1935, this Canadian developed the creamed honey formulas for soft, 'spun', semi-granulated honey. Eva Crane - This beekeeper, bee researcher, and nuclear physicist was author of several books, including Archeology of Beekeeping, and Honey. Fred Hale, Sr. - Before he died at age 113, in November, 2004, Fred Hale was the oldest man in the world. An easy-going Maine beekeeper and gardener, he had retired from railroad work 50 years before his death. He was driving a car at age 108 and shoveling snow at age 112. Gregor Mendel - Monks aren't usually fathers, but Mendel was the father of genetics and a beekeeper when he did his famous experiments that proved tall peas begat tall peas most of the time. Gregor Mendel, discovered the fundamental laws of genetics in pea plants, then spent the rest of his life trying to breed better bees, without success. It would take later generations to figure out that drones have no father, workers are half-sisters, and the queen has two grandmothers but only one grandfather. Without knowing any of this, honey bee genetics was undecipherable. Harlan J. Smith, PhD - This Texan beekeeper was director of McDonald Observatory since 1963 and attained worldwide recognition as an astronomer, researcher and administrator of one of the world's finest observatories and in his work with NASA. Harry H. Laidlaw, Jr. - Professor Laidlaw of the U of C Davis Department of Entomology was considered the pioneer in bee genetics and aspects of practical bee breeding. But here's this beekeeper's other claim to fame - his first book was published in 1932, while his most recent was published in 1997 - he wrote and published for 65 years!! Henry Fonda - The star of 96 films, this hobby beekeeper gave away honey in jars that he labeled Henry's Honey. When he was a youngster, he'd earned the Eagle Scout's merit badge for beekeeping. Horacio Quiroga - Surrealistic writer of late 19th century Uruguay, Quiroga (1878-1937) excelled in the intense portraying of mental illness and hallucinatory states and in depicting epic struggles of survival, usually in primordial settings. Metaphorically (in his plays and stories) as well as physically (attempting to tame savage animals), he spent years in his jungles. Among his physical beasts were, of course, honey bees. With all his brutish themes, it is surprising that his children's book about a lazy expelled bee fending off a snake that would it her, is so popular. But you can buy a pretty, colourful version ofThe Lazy Bee for your own children to enjoy. Or, you may go on-line to read the story. Huber - In the late 18th Century, the blind Swiss naturalist and beekeeper Francois Huber developed special bee hives to improve scientific observation of his bees. His work, viewed through the eyes of his assistant and his wife, resulted in the first clear understanding of the concept of "bee space" - the secret to the building of modern hives with moveable frames. The story of his assistant (François Burnens) and their discoveries is sweetly told in Sara George's book The Beekeeper's Pupil . Icarus - This ancient Greek astronaut flew too close to the sun and the beeswax holding the feathers to his arms melted - the feathers came loose and he is still falling. Indra - Goddess and namesake of ancient India - her first food as a little baby goddess was honey. Janscha - Maria Theresa's Royal Beekeeper, from Slovenia. In 1771 Anton Janscha discovered how bees mate. He unraveled the ridiculous honey bees system of no fathers for drones, sisterhood among the workers (and queen). Jim Powers - During the 1960s, 70s, and 80s, Jim operated 30,000 hives in Idaho, the Dakotas, Hawaii, Florida, and Texas. He had the largest honey farm in the USA at the time and was generally a rather wise and progressive beekeeper. Before that, he was a CIA officer in Central America. Jirí Dienstbier - A leader of the Czech Republic's Social Democratic Party and a Senator, Dienstbier says he is also a very enthusiastic beekeeper. Johannes Mehring - This German beekeeper invented wax comb foundation, 1857. John Greenleaf Whittier - This New England 19th century poet (1807-1892) kept bees and wrote the tale of telling the bees about the death of their master. Jonathan Swift - In "The Battle of the Books," wrote that the bee said: "Instead of dirt and poison, we have chosen to fill our hives with honey and wax, thus furnishing mankind with the two noblest of things, which are sweetness and light." JS Harbison - One of the first beekeepers in California. Harbison arrived from Lawrence County, Pennsylvania, about 1850 and brought bees from the east, through Panama, and up to southern California. His greatest claim to fame was the biggest crop of honey in the world (1868) and his subsequent shipment of train car loads of comb honey from California to Chicago and New York. Juraj Fándly - Father Fándly was a nineteenth century Slovak priest who wrote about a history of Slovakia, but also wrote a treatise on bees in 1801, and published Slovenskí vðelá, (the Slovakian beekeeper), in 1802. Karl von Frisch - Translated the bee's dance into German and won the Nobel Prize for this and related animal beehavior studies. Krishna - The Hindu deity, has often been depicted as a bee. Four thousand years ago, Hindu ancestors taught that eating honey and pollen would lead to a long life... If Krishna is a bee, this could change our perspective on the 'Hairy' Krishnas. Le Quy Quynh - A military strategist and medical healer, Le Quy Quynh resides in Ho Chi Minh City (Saigon), Vietnam. He is well known and respected in Vietnam as a "Hero of the Revolution" for leading forces from the North first against the French, then against the US. He served as Adjutant to General Giiap, and as defense minister in Ho Chi Minh's first post-war cabinet. However, his real claim to fame is his 50 years as a beekeeper and his research, cultivation and medical treatment using bees and bee products. He is famous in Vietnam for his healing techniques -many of his patients are victims of severe war related injuries - he has worked wonders on their wounds. He is interested in exchanging information with others - through his American grandson. Leo Tolstoy - This Russian author was a beekeeper. His wife, Sonja, talked about him "crouching in front of his hives, net over his head." And she wrote in her diary, "The apiary has become the centre of the world for him now, and everybody has to be interested exclusively in Bees!" Tolstoy mentions beekeeping twice in War and Peace (it's a long book, you'd expect beekeeping to come up, wouldn't you?) Tolstoy describes the evacuation of Moscow: "Moscow was empty. It was deserted as a dying, queenless hive is deserted." Read more on bees and beekeeping from War and Peace. L.L. Langstroth - This minister discovered the practical use of Bee-Space and designed the beehive commonly used in North America, in 1851. His 1853 book, The Hive and the Honey Bee, is brilliantly written, and is the first descriptive treatise of our modern bee management techniques which are still used 150 years later. Lord Alexander - British Minister of Defence under Churchill kept bees in Rideau Park (Ottawa) while he was Governor-General of Canada. Lord Baden Powell - Founder of the Boy Scouts in England. This beekeeper, when once producing honey for showing, mistakenly allowed it to overheat and the honey became dark. He showed it anyway and due to his prestige this created a fashion for dark honey in England for many years. Luis Mendez de Torres - Spanish scientist, discovered the queen is a female and mother to the bees in the hive in 1586. Luke - The author of the Book of Luke says the first food eaten by Christ after his resurrection was fish and honey: Jesus might have said, "Have you got food? I haven't had anything to eat in three days!" And they offered him a piece of broiled fish and a honeycomb, which he ate. Luke, Chapter 24, 41-43. Lycurgus - The founder of Sparta was so impressed by the honeybees' social structure, sacrifice, and sharing that he used the bee colony as his model for a perfect form of government for the Spartans. Marcus Aurelius - This famous Roman emperor, philosopher, and potentially world's first Socialist said, "What is not good for the swarm is not good for the bee." Maria von Trapp - Yes, after the family escaped Austria, the little nun and governess from the Sound of Music kept bees on her Vermont farm. Marla Spivak - A pioneering honeybee researcher, Spivak has been developing hygienic bees for us non-hygienic beekeepers for years. She is helping form the Bee Research and Discovery Center which will showcase honey making and beekeeping at the University of Minnesota. She is a university prof (including Ent 4021 Honey Bees and Insect Societies and Ent 8061 Scientific Communication and Ethics) and in 2010 she won one of the $500,000 "genius grant" from the John D. and Catherine T. MacArthur Foundation. Martha Stewart - The cute-as-a-button harbinger of American Style has been a model, a stockbroker, and a beekeeper for over twenty-five years! The avid gardener realized a long time ago that keeping bees is a good thing. If you are unfamiliar with this fascinating character, crawl out from under your rock and jump to Martha Stewart Living! Martin John - In 1684, this English beekeeper discovered that bees make wax, they don't gather it. Maurice Maeterlinck - This Nobel Prize Winner in Literature (1911) - author, playwright, and leader in symbolist drama was a beekeeper for sixty years. He wrote The Life of the Bees in 1901, his work in prose that deals with philosophy and nature. Mew - The Reverend Bill Mew developed one of the first really modern hives in 1649 - complete with multi-story honey holding boxes and top bar frames. He got many of his ideas from the common Greek hive he had seen on his travels. Mohammed - The founder of Islam said, "Honey is the remedy for every illness." We have more from the Quran thanks to Farzaneh Shahrtash. Mohammed Ali - Former heavy-weight champ ate lots of pollen and honey and attributed this as part of the reason he could sting like a bee. Moravians - It is claimed in the book "The Trail of the Black Walnuts" that the Moravian missionaries to Kent County, Ontario, brought the first hives of bees to Canada in 1792. This seems unlikely as bees had been in the British American colonies to the south since at least 1650. However, the Moravians were beekeepers and encouraged the pursuit at their missions. Moses Quinby - This beekeeper invented the modern bee smoker in 1875. But much earlier - in the 1830s, he was the first large-scale commercial honey producer in North America. Moses Quinby made as much as 20,000 pounds of honey a year from hives kept in boxes - no moveable combs, no foundation for frames, no extractors in those days. His 1853 book, Mysteries of Bee-Keeping Explained, encouraged the rapid growth of beekeeping as a business. Napoleon Bonaparte - used the bee as his person symbol of his personal immortality. His red cape is remembered for its bee print, perhaps stitched on by his wife, Empress Josephine, or perhaps not. Nichel Jacob - This German scientist/beekeeper discovered that workers could raise a new queen from a young larvae - in 1568; discovery led to modern queen rearing systems. Olga - A Saint of the Slavic persuasion, Olga was also a pretty brutal warrior. She invited her enemies to her son's funeral, gave them her most potent honey-wine (five times as much alcohol as regular wine) and then had her soldiers kill all four thousand of the drunks. Olga remains the patron saint of not getting drunk in our enemy's home. Paul Theroux - A contemporary American writer (The Great Railway Bazaar plus about 50 published short stories, novels, and non-fiction books) keeps a large apiary at his home on Oahu. He sells his whole crop to Ellen Wong's restaurant in Honolulu. Peter Fonda - actor, activist, was named beekeeper of the Year by the Florida State Beekeeping Association for deftly portraying Ulee in Ulee's Gold, and for his contributions to beekeeping. 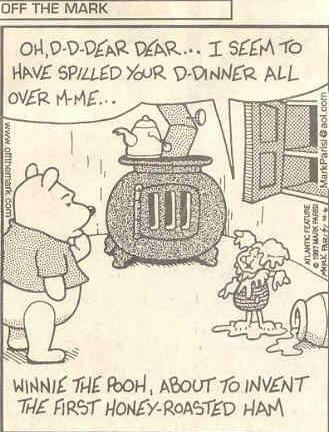 Pooh, Winnie the - Sometimes considered a cuddly creature, he could be acutely mischievous, as evidenced in his last interaction with Piglet. Pope Urban III - used the bees as his official stamp and symbol in Rome in 1626. Presidents of the United States - A motley duo may have distinguished themselves as successful revolutionaries, but both George Washington and Thomas Jefferson poked their hands into bees nests more than a few times in their careers. One visitor to this web site tells me that the first president, agricultural experimenter and beekeeper honest George Washington, who never told a lie nor exaggerated about the size of his honey crop, probably kept bees in progressive wooden boxes (instead of gums or skeps) according to records in the storehouse at Mount Vernon. Prince Cesi - In 1625, this Italian prince and beekeeper made the world's first microscopic drawings of honeybees. Peter Prokopovich - From 1800 to 1810, this Ukrainian beekeeper kept 10,000 hives (!) in the Ukraine - the first truly large-scale commercial beekeeper in the world. Pythagoras - Ancient Greek mathematician, cult founder, and beekeeper - the strictest of his followers ate only bread and honey. Ramses III - This ancient Egyptian Pharaoh, King, Deity, and Ruler of Heaven and Earth (but only from 1198-1167 BC), offered a lesser river god a 30,000 pound honey sacrifice by dumping beekeepers' honey into the Nile. Raymond Poincare - This beekeeper was president of France during the Great War. He took time out by tending his beehives behind the Presidential Palace. Richard Remnant - In England, 1637, found that worker bees are female bees. Dr. Richard Taylor - This beekeeper was a very serious comb honey producer - his Joy of Beekeeping is considered the definitive work on the subject. At Cornell University, his day job was teaching (and thinking about) philosophy. His book Metaphysics is still the best introduction to the subject and is used as a text book for first year philosophy students. Rob Smith - This Australian beekeeper produced a world record 762 pounds from each of 460 hives in 1954. Robert Holekamp - A German immigrant and one of St Louis, Missouri's leading businessmen around 1900, he was also the state's leading beekeeper. Concerned about the spread of foulbrood disease among bees in Missouri, Holekamp proposed a bill and successfully lobbied to see it passed - one of the first laws to set up an inspection office and system for bee disease control in the USA. The Romans - The ancient Romans shot beehives as catapult projectiles. They found this ammunition so effective that they depleted most of central Italy of bees. Ron - This beekeeper, author (Bad Beekeeping), and computer programmer is president of a high-tech geophysical analysis business. As a university student, he won Canada's highest award for excellence in geophysics and helped develop the 3-dimensional calculus algorithms applied with Greene's functions to reduce atmospheric pressure effects from residual super-conducting gravimeter responses. He can sort of read five languages (and won the University's Russian Language Award); has been a radio announcer in Florida, folk guitar picker with the Trottier Family Band, a licensed professional engineer in Alberta, and bee inspector in Pennsylvania. He has raised a few thousand queens and packages, and produced over a million pounds of honey in Alberta, Saskatchewan, Pennsylvania, Wisconsin, and Florida. Ron is active with the family honey farm, Summit Gardens Honey Farms, of Calgary, Alberta, Canada. He is also a Daddy, but still finds time to operate one of the world's most popular web sites for beekeepers. Samson - The bible guy, discovered a swarm of honey bees living in a lion's carcass: "Out of the eater came something to eat, out of the strong came something sweet"(Judges 14). Sherlock Holmes - This great detective retired to a simple life of puttering around with bees. As a beekeeper, he continued to demonstrate his problem-solving expertise. Shirley Ann Jackson, PhD - Starting with a beekeeping experiment in grade school (She called it an early failed attempt at genetic experimentation.) this African-American is now (November 2004) the president of Rensselaer Polytechnic Institute. Sir Edmund Hillary - A commercial beekeeper (he and his brother owned 1200 hives) from New Zealand, along with Tenzing Norgay, first scaled Mount Everest, in May, 1953. Sir George Wheler - British traveler described moveable top-bar frames used traditionally used in Greece. His 1682 writings preceded the Langstroth moveable comb hive by almost 200 years. St. Ambrose - In legend, a swarm landed on this infant's mouth, predicting a life as a great orator. No information has ever been given on the amount of honey harvested from his face, but you can learn much more about him at this web site. Steve Vai - His fans claim he's perhaps the best guitar player on this planet we call home. You can read about Steve's big obsession with honey bees at Steve Vai's Bee Page. You can hear his music on any radio. Sue Hubbell - Critically acclaimed best selling author of A Book of Bees, A Country Year, Broadsides from the Other Orders: A Book of Bugs, and Waiting for Aphrodite. Sylvia Plath - American poet (for something really depressing, try (The Bee Meeting) and author, 1932 - 1962, inspired largely by her father, Otto Plath, and his beekeeping. She lived a tragic, prolific, short life. Her biography is on Great American Poets: Plath. Thomas Edison - We don't know if Tom himself was a beekeeper, but his estate in Fort Myers, Florida, continues to keep bees in the fashion that Edison may have had them when he was producing beeswax for use in his scientific experiments. Thomas Jefferson - He was the third American president, but he had a lot of interests outside politics. He was one of the first Unitarians (and wrote a new version of the Bible), he was a farmer (he developed new planting techniques) and an avid beekeeper. Thomas Jefferson, in his nature book Notes on Virginia, wrote this about how the honey bee came to North America: "The honeybee is not a native of our country. Marcgrave, indeed, mentions a species of honeybee in Brazil. But this has no sting, and is therefore different from the one we have, which resembles perfectly that of Europe. The Indians concur with us in the tradition that it was brought from Europe, but when and by whom we know not. The bees have generally extended themselves into the country a little in advance of the settlers. The Indians, therefore, called them the white man's fly, and consider their approach as indicating the approach of the settlement of the whites." Turlough O'Bryen - During the late 1800s, O'Bryen rode his bicycle up and down Ireland promoting beekeeping as a way for the stressed potato farmers to supplement their livelihoods. Ireland is not a great place for keeping bees - crops are marginal. So we don't know if his promotion of the craft had a positive net effect or not. Ulee - This fictional Florida beekeeper, played by Peter Fonda, became famous with the release of the dramatic, acclaimed feature film Ulee's Gold, starring Peter Fonda and Patricia Richardson - released June 13, 1997. Vicente Fox - The president of Mexico says that they used bee stings as a test for bravery on the family ranch when he was a youngster. Viktor Yushchenko- The leader of the democracy (orange) movement and president of the Ukraine is an avid beekeeper. Virgil - A beekeeper and poet, he wrote about bees in the Aeneid. "Such is their toil and such their pain; As is the bees' in their flowery plain... All with united force combine to drive, the lazy drones from the laborious hive...."
Waldo McBurney - He was recognized as America's 'oldest worker' at age 104 in 2006. His job? Beekeeping, of course. Warwick Kerr - Kerr is the great-grandson of a Confederate army colonel from the southern states who settled in Brazil after the American Civil War. Dr. Kerr has been an outstanding spokesman for Brazil's poor and politically oppressed, and this has led to a brief internment in prison a few years ago. As an apicultural researcher, social activist, and beekeeper, he brought African bee stock to Brazil in an attempt to improve honey production and the standard of living for poor and indigenous beekeepers in the South American tropics. An assistant accidentally released 26 mated African queen bees into the wild in 1957. The Brazilian military government tried to discredit Kerr's science because of his politics. To learn a bit more about this, please go to Dr. Kerr's Page. The Bad Beekeeping: The Beekeeper's Home Pages website is mostly written by Ron Miksha, who lives in a bee hive in Calgary, Alberta, Canada. (OK, he doesn't really live in a bee hive - but he once had a lot of beehive furniture in his house - we know, we've seen it ourselves.) Ron's honey bee blog is updated at erratic intervals, with sticky new entries typically pasted in fortnightly. (eg.. wiki-public commons, dreamstime.com) Opinions expressed herein do not necessarily express anyone's opinions - not even the author's. Please follow this link, if you need more details. This site covers almost everything about the beehive, bees, and honey. Ron has worked with bees in Pennsylvania, Florida, Wisconsin, Saskatchewan, and Alberta and peeked into hives on three continents. Read our site for honey bee tips and opinions on everything from colony collapse disorder and Africanized honey bees, to queen bees and bee pollen, to building a hive and hiving a swarm... it's all here, so join the colony - explore and enjoy! 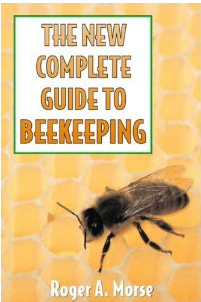 Ron has written dozens of bee journal articles and has also penned the book on Bad Beekeeping, which is called "Bad Beekeeping," for obvious reasons. If you are wondering why this blog is sometimes weird and hard to understand, it may be because Ron is also a geophysicist - but has also been a beekeeper for a few dozen years. Ron's family operates Summit Gardens Honey Farms, a western Canada honey bee farm specializing in comb honey. So, this blog might be considered "A Physicist's Guide to Comb Honey Beekeeping Gone Bad".